If you don’t know what to do with your Thanksgiving leftovers, here’s a great Thanksgiving Pot Pie courtesy of Common Ground Bar and Grill in Allston, Massachusetts. Here is a great way to use those leftovers from your feast from the day before. Start with the topping so it has time to cool while making your pie. Sautee garlic, add carrots, corn, boiled potatoes, peas, gravy, and chopped thyme. Bring to a boil then add the cream, mashed potatoes and seasoning. Stir til brought back to boil. Add all ingredients to mixing bowl then puree. Place on flat surface and flatten to size of individual serving bowl and cut (should be a ¼ inch thick). Par cook for 10 min. at 325 degrees.. Cut top of pie to size of serving dish. Boil sugar and water, then add rest of ingredients. Reduce heat to medium and simmer for ten minutes. Remove from heat, puree and pour into serving dish. Let cool. Pour filling into crust then cover with top crust. Pinch edges together. Cook in oven at 325 degrees for about 15 mins. Or golden brown. 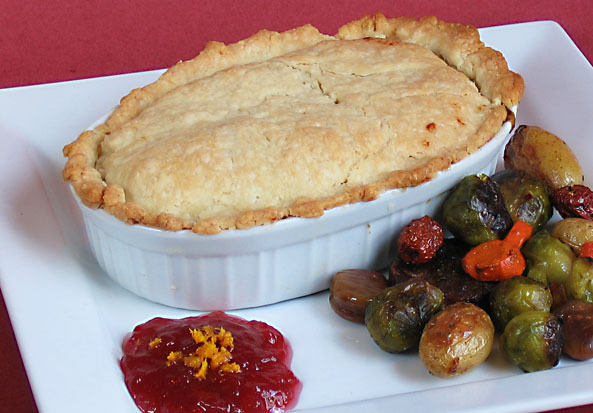 Take out of oven, add cranberry jam to top of Pot Pie And serve to delighted guest.